We have included several useful developer tools in our containers. Run ddev describe to see the project information and services available for your project and how to access them. MySQL Client (mysql) - Command-line interface for interacting with MySQL. Drush - Command-line shell and Unix scripting interface for Drupal. WP-CLI - Command-line tools for managing WordPress installations. These tools can be accessed for single commands using ddev exec <command> or ddev ssh for an interactive bash session. Both composer and Docker Desktop for Windows introduce quite complex filesystem workarounds. DDEV attempts to help you with each of them. You generally don't have to worry about any of this, but it does keep things cleaner. Mostly just a few of the more complex TYPO3 projects have been affected. DDEV-Local attempts to clean up for this situation. Since Windows 10 (in developer mode) can now create real symlinks, DDEV-Local scans your repository after a ddev composer command and attempts to convert XSym files into real symlinks. It can only do this if your Windows 10 host is set to Developer Mode. 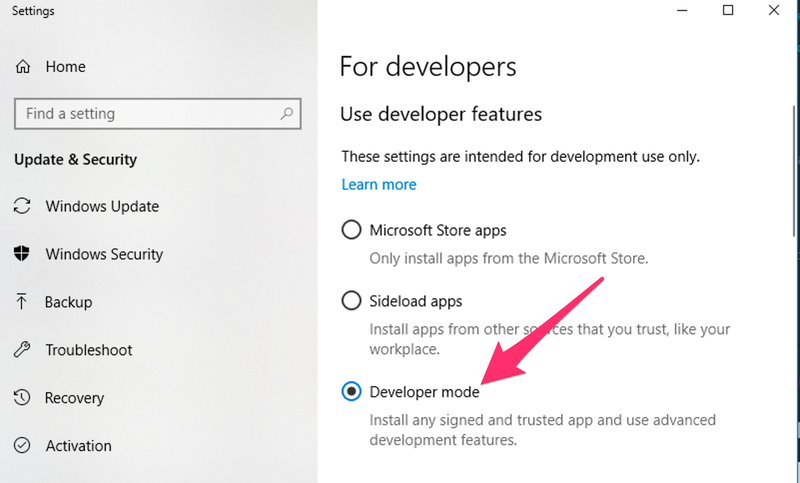 On Windows 10, to set your computer to developer mode, search for "developer" in settings. Screenshots are below. Docker Toolbox (Windows 10 Home) does not have any capability to create symlinks inside the web container on a mount. But composer detects this and uses copies instead of symlinks. MailHog is a mail catcher which is configured to capture and display emails sent by PHP in the development environment. Please note this will not intercept emails if your application is configured to use SMTP or a 3rd-party ESP integration. If you are using SMTP for outgoing mail handling (Swiftmailer or SMTP modules for example), update your application configuration to use localhost on port 1025 as the SMTP server locally in order to use MailHog. phpMyAdmin is a free software tool to manage MySQL and MariaDB databases from a browser. phpMyAdmin comes installed with ddev. If you use the free Sequel Pro database browser for macOS, run ddev sequelpro within a project folder, and Sequel Pro will launch and access the database for that project. It is possible in many cases to use development tools installed on your host machine on a project provisioned by ddev. Tools that interact with files and require no database connection, such as Git or Composer, can be run from the host machine against the code base for a ddev project with no additional configuration necessary. The port referenced is unique per running project, and randomly chosen from available ports on your system when you run ddev start. Note: The host database port is likely to change any time a project is stopped/removed and then later started again. If you have PHP and Drush installed on your host system, you can use it to interact with a ddev project. On the host system the extra include ddev_drush_settings.php is written on startup and will allow drush to access the database server. This may not work for all drush commands because of course the actual webserver environment is not available.